Islamic–Jewish relations started in the 7th century CE with the origin and spread of Islam in the Arabian peninsula. The two religions share similar values, guidelines, and principles. Islam also incorporates Jewish history as a part of its own. Muslims regard the Children of Israel as an important religious concept in Islam. Moses, the most important prophet of Judaism, is also considered a prophet and messenger in Islam. Moses is mentioned more in the Quran than any other individual, and his life is narrated and recounted more than that of any other prophet. There are approximately forty-three references to the Israelites in the Quran (excluding individual prophets), and many in the Hadith. Later rabbinic authorities and Jewish scholars such as Maimonides discussed the relationship between Islam and Jewish law. Maimonides himself, it has been argued, was influenced by Islamic legal thought. Because Islam and Judaism share a common origin in the Middle East through Abraham, both are considered Abrahamic religions. There are many shared aspects between Judaism and Islam; Islam was strongly influenced by Judaism in its fundamental religious outlook, structure, jurisprudence and practice. Because of this similarity, as well as through the influence of Muslim culture and philosophy on the Jewish community within the Islamic world, there has been considerable and continued physical, theological, and political overlap between the two faiths in the subsequent 1,400 years. The Cave of the Patriarchs, burial place of Abraham. 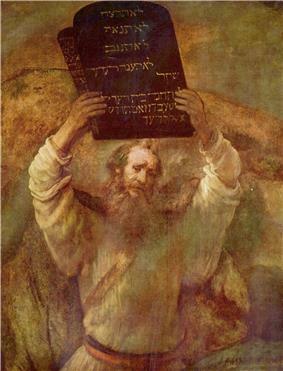 Moses with the Ten Commandments, by Rembrandt. The term Semitic is due to the legendary derivation of the peoples so called from Shem, son of Noah (Gen. x, 1). Hebreaic and Arabian peoples are generally classified as Semitic, a concept derived from Biblical accounts of the origins of the cultures known to the ancient Hebrews. Those closest to them in culture and language were generally deemed to be descended from their forefather Shem, one of the sons of Noah. Enemies were often said to be descendants of his cursed nephew Canaan, grandson of Noah, son of Ham. Modern historians confirm the affinity of ancient Hebrews and Arabs based on characteristics that are usually transmitted from parent to child, such as genes and habits, with the most well-studied criterion being language. Similarities between Semitic languages (including Hebrew and Arabic) and their differences with those spoken by other adjacent people confirm the common origin of Hebrews and Arabs among other Semitic nations. Around the 12th century BCE, Judaism developed as a monotheistic religion. According to Jewish tradition, the history of Judaism begins with the Covenant between God and Abraham, who is considered a Hebrew. (The first Hebrew being Eber, a forefather of Abraham.) The Hebrew Bible occasionally refers to Arvi peoples (or variants thereof), translated as "Arab" or "Arabian" deriving from "Arava" plain, the dwellers of plains. Some Arabs of the Arabian Peninsula are considered descendants of Ismael, the first son of Abraham. 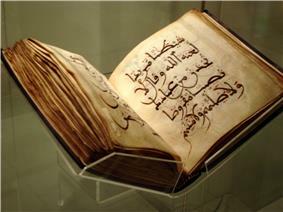 While the commonly held view among historians, most Westerners and some lay Muslims is that Islam originated in Arabia with Muhammad's first recitations of the Qur'an in the 7th century CE. In Islam`s view, the Qur'an itself asserts that it was Adam who is the first Muslim (in the sense of believing in God and surrendering to God and God's commands). Islam also shares many traits with Judaism (as well as with Christianity), like the belief in and reverence for common prophets, such as Moses and Abraham, who are recognized in all three Abrahamic religions. In the course of Muhammad's proselytizing in Mecca, he initially viewed Christians and Jews (both of whom he referred to as "People of the Book") as natural allies, sharing the core principles of his teachings, and anticipated their acceptance and support. 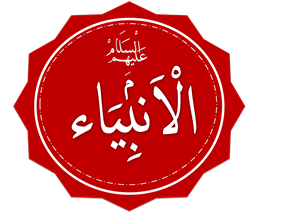 Ten years after his first revelation in Mount Hira, a delegation consisting of the representatives of the twelve important clans of Medina pledged to physically protect Muhammad and invited him as a neutral outsider to Medina to serve as chief arbitrator for the entire community, which had been fighting with each other for around a hundred years and was in need of an authority. Among the things Muhammad did in order to settle down the longstanding grievances among the tribes of Medina was drafting a document known as the Constitution of Medina. The community defined in the Constitution of Medina had a religious outlook but was also shaped by the practical considerations and substantially preserved the legal forms of the old Arab tribes. Muhammad also adopted some features of the Jewish worship and customs such as fasting on the Yom Kippur day. According to Alford Welch, the Jewish practice of having three daily prayer rituals appears to have been a factor in the introduction of the Islamic midday prayer but that Muhammad's adoption of facing north towards Qiblah (position of Jerusalem - Islam's first Qiblah or direction of prayer, which subsequently changed to face the Kabah in Mecca) when performing the daily prayers however was also practiced among other groups in Arabia. Many Medinans converted to the faith of the Meccan immigrants, particularly pagan and polytheist tribes, but there were fewer Jewish converts. The Jews rejected Muhammad's claim to prophethood, and further argued that some passages in the Qur'an contradicted with the Torah. Their opposition was due to political as well as religious reasons, as many Jews in Medina had close links with Abd-Allah ibn Ubayy, who was partial to the Jews and would have been Medina's prince if not for Muhammad's arrival. Mark Cohen adds that Muhammad appeared "centuries after the cessation of biblical prophecy" and "couched his message in a verbiage foreign to Judaism both in its format and rhetoric." Maimonides, a Jewish scholar, referred to Muhammad as a false prophet. Moreover, Maimonides asserted that Muhammad's claim to prophethood was in itself what disqualified him, because it contradicted the prophecy of Moses, the Torah and the Oral Tradition. His argument further asserted that Muhammad being illiterate also disqualified him from being a prophet. In the Constitution of Medina, Jews were given equality to Muslims in exchange for political loyalty and were allowed to practice their own culture and religion. However, as Muhammad encountered opposition from the Jews, Muslims began to adopt a more negative view on the Jews, seeing them as something of a fifth column. Jewish violations of the Constitution of Medina, by aiding the enemies of the community, finally brought on major battles of Badr and Uhud which resulted in Muslim victories and the exile of the Banu Qainuqa and Banu Nadir, two of the main three Jewish tribes from Medina. Both regard many people as being prophets with exceptions. Both unlike Christianity teach Eber, Job, and Joseph were prophets. However, according to one sage in Judaism the whole story attributed to Job was an allegory and Job never actually existed. Rashi, a Jewish commentator on the Hebrew Scriptures quotes a text dating to 160CE, which is also quoted in the Talmud on his commentary on Genesis 10 to show that Eber was a prophet. Jews have often lived in predominantly Islamic nations. Since many national borders have changed over the fourteen centuries of Islamic history, a single community, such as the Jewish community in Cairo, may have been contained in a number of different nations over different periods. 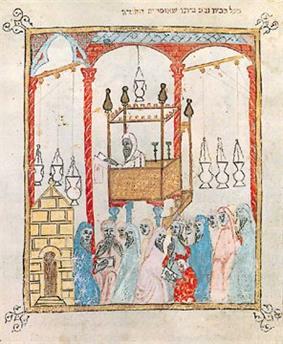 Image of a cantor reading the Passover story in Al Andalus, from the 14th century Haggadah of Barcelona. In the Iberian Peninsula, under Muslim rule, Jews were able to make great advances in mathematics, astronomy, philosophy, chemistry and philology. This era is sometimes referred to as the Golden age of Jewish culture in the Iberian Peninsula. Traditionally Jews living in Muslim lands, known (along with Christians) as dhimmis, were allowed to practice their religion and to administor their internal affairs but subject to certain conditions. They had to pay the jizya (a per capita tax imposed on free, adult non-Muslim males) to the Muslim government but is exempted from paying the zakat (a tax imposed on free, adult Muslim males). Dhimmis were prohibited from bearing arms or giving testimony in most Muslim court cases, for there were many Sharia laws which did not apply to Dhimmis, who practiced Halakha. A common misconception is that of the requirement of distinctive clothing, which is a law not taught by the Qur'an or hadith but allegedly invented by the Sunni in early medieval Baghdad. Jews rarely faced martyrdom or exile, or forced compulsion to change their religion, and they were mostly free in their choice of residence and profession. The notable examples of massacre of Jews include the killing or forcible conversion of them by the rulers of the Almohad dynasty in Al-Andalus in the 12th century. Notable examples of the cases where the choice of residence was taken away from them includes confining Jews to walled quarters (mellahs) in Morocco beginning from the 15th century and especially since the early 19th century. Most conversions were voluntary and happened for various reasons. However, there were some forced conversions in the 12th century under the Almohad dynasty of North Africa and al-Andalus as well as in Persia. The medieval Volga state of Khazaria converted to Judaism, whereas its subject Volga Bulgaria converted to Islam. Islam accepts converts, and spreading Dawah to other religious adherents including Jews. In modern times, some notable converts to Islam from a Jewish background include Muhammad Asad (b. Leopold Weiss), Abdallah Schleifer (b. Marc Schleifer), Youssef Darwish, Layla Morad and Maryam Jameelah (b. Margret Marcus). More than 200 Israeli Jews converted to Islam between 2000 and 2008. Historically, in accordance with traditional Islamic law, Jews generally enjoyed freedom of religion in Islamic states as People of the Book. However, certain rulers did historically enact forced conversions for political reasons and religious reasons in regards to youth and orphans. A number of groups who converted from Judaism to Islam have remained Muslim, while maintaining a connection to and interest in their Jewish heritage. These groups include the anusim or Daggataun of Timbuktu who converted in 1492, when Askia Muhammed came to power in Timbuktu and decreed that Jews must convert to Islam or leave, and the Chala, a portion of the Bukharan Jewish community who were pressured and many times forced to convert to Islam. In Turkey, the claimed messiah Sabbatai Zevi was forced to convert to Islam in 1668. Most of his followers abandoned him, but several thousand converted to Islam as well, while continuing to see themselves as Jews. They became known as the Dönmeh (a Turkish word for a religious convert). Some Donmeh remain today, primarily in Turkey. Judaism does not proselytize, and often discourages conversion to Judaism; maintaining that all people have a covenant with God, and instead encourages non-Jews to uphold the Seven Laws which it believes were given to Noah. Conversions to Judaism are therefore relatively rare, including those from the Islamic world. One famous Muslim who converted to Judaism was Ovadyah, famous from his contact with Maimonides. Reza Jabari, an Iranian flight attendant who hijacked the air carrier Kish Air flight 707 between Tehran and the resort island of Kish in September 1995, and landed in Israel converted to Judaism after serving four-and-a-half years in an Israeli prison. He settled among Iranian Jews in the Israeli Red Sea resort town of Eilat. Another such case includes Avraham Sinai, a former Hezbollah fighter who, after the Israel-Lebanon War ended, fled to Israel and converted from Islam to become a religious and practicing Jew. Iran contains the largest number of Jews among Muslim countries and Uzbekistan and Turkey have the next largest communities. Iran's Jewish community is officially recognized as a religious minority group by the government, and, like the Zoroastrians, they were allocated a seat in the Iranian parliament. In 2000 it was estimated that at that time there were still 30–35,000 Jews in Iran, other sources put the figure as low as 20–25,000. They can not emigrate out of Iran, since the government only allows one family member to leave and be out of the country at a time. A Jewish businessman was hanged for helping Jews emigrate. In present times, the Arab-Israeli conflict is a defining event in the relationship between Muslims and Jews. The State of Israel was proclaimed on 14 May 1948, one day before the expiry of the British Mandate of Palestine. Not long after, five Arab countries—Egypt, Syria, Jordan, Lebanon and Iraq—attacked Israel, launching the 1948 Arab-Israeli War. After almost a year of fighting, a ceasefire was declared and temporary borders, known as the Green Line, were instituted. Jordan annexed what became known as the West Bank and Egypt took control of the Gaza Strip. Israel was admitted as a member of the United Nations on 11 May 1949. During the course of the hostilities, 711,000 Arabs, according to UN estimates, fled or were expelled. The following decades saw a similar Jewish exodus from Arab lands where 800,000-1,000,000 Jews were forcibly expelled or fled from Arab nations due to persecution. A Judaeo-Christian-Muslim concept thus refers to the three main monotheistic religions, commonly known as the Abrahamic religions. Formal exchanges between the three religions, modeled on the decades-old Jewish-Christian interfaith dialogue groups, became common in American cities following the 1993 Israeli-Palestinian Oslo accords. One of the country’s most prominent mosques is the New York Islamic Cultural Center, built with funding from Kuwait, Saudi Arabia, and Malaysia. Its imam, Mohammad Al-Gamei'a, disappeared two days after 9/11. Back in Egypt, he was interviewed on an Arabic-language Web site, charging that the "Zionist media" had covered up Jewish responsibility for the terrorist attack on the World Trade Center. He agreed with Osama bin Laden's accusations in bin Laden's Letter to America, claiming that Jews were guilty of "disseminating corruption, heresy, homosexuality, alcoholism, and drugs." And he said that Muslims in America were afraid to go to the hospital for fear that some Jewish doctors had "poisoned" Muslim children. "These people murdered the prophets; do you think they will stop spilling our blood? No," he said. Cowling, Geoffrey (2005). Introduction to World Religions. Singapore: First Fortress Press. ^ a b Prager, D; Telushkin, J. Why the Jews? : The Reason for Antisemitism. New York: Simon & Schuster, 1983. pp. 110-126. ^ Quran 19:51: "Also mention in the Book (the story of) Moses: for he was specially chosen, and he was a messenger (and) a prophet." ^ Annabel Keeler, "Moses from a Muslim Perspective", in: Solomon, Norman; Harries, Richard; Winter, Tim (eds. ), Abraham's children: Jews, Christians, and Muslims in conversation, by. T&T Clark Publ. (2005), pp. 55 - 66. ^ a b c Esposito, John. (1998), Islam: the Straight Path, extended edition. Oxford university press, p.17. ^ "JOSEPH - JewishEncyclopedia.com". jewishencyclopedia.com. ^ "The Prophets Of Islam – A Referenced List". islamtutor.com. ^ "JOB - JewishEncyclopedia.com". jewishencyclopedia.com. One of the amoraim expressed his opinion in the presence of Samuel b. Naḥmani that Job never existed and that the whole story was a fable (B. B. 15a). ^ http://www.yutorah.org/_materials/SWeiss_102307.pdf "Job never existed and was never created, but was only a mashal [ie.a fictional tale]" (b. Baba Bathra 15a). Those, on the other hand, who believe that he "existed and was created" and that the story happened, do not know at what time and in what place he lived." ^ Felter, Nurit (14 November 2008). "Sharp drop in Christians converting to Judaism". Ynetnews. Retrieved 18 April 2012. ^ Primack, Karen. "The Renewal of Jewish Identity in Timbuktu", kulanu.org. Retrieved 12 November 2006. ^ Abbas, Najam. (The Outcast) by Mansur Surosh Dushanb)Chala"The Outsiders" (review of , kulanu.org. Retrieved 16 April 2007. ^ a b Yardeni, Dan. (2010-04-25) Jewish History / Waiting for the Messiah - Haaretz Daily Newspaper | Israel News. Haaretz.co.il. Retrieved on 2010-10-19. ^ Cambridge Journals Online - Abstract. Journals.cambridge.org (2005-05-12). Retrieved on 2010-10-19. ^ Avraham Sinai: From Undercover Hizbullah Shiite To Orthodox Jew,Avraham Shmuel Lewin, Jewish Press Israel Correspondent. Jewishpress.com (2006-09-27). Retrieved on 2010-10-19. ^ Report, Reuters, 16 February 2000, cited from Bahá'í Library Online. The Encyclopaedia Judaica estimated the number of Jews in Iran at 25,000 in 1996. ^ a b "Part 3: Partition, War and Independence". The Mideast: A Century of Conflict. National Public Radio. 2 October 2002. Retrieved 13 July 2007. ^ "Two Hundred and Seventh Plenary Meeting". The United Nations. 11 May 1949. Retrieved 13 July 2007. ^ "Slavoj Zizek - A Glance into the Archives of Islam". lacan.com. ^ "Jewish Nobel Prize winners". Jinfo.org. ^ "FFEU Muslim-Jewish Program". The Foundation for Ethnic Understanding. Retrieved 18 September 2013. ^ (TAM). The American Muslim (2005-12-01). Retrieved on 2010-10-19. ^ Machine-slaughtered Meat, Shaykh Muhammad ibn Adam al-Kawthari, eat-halal.com. Retrieved 23 March 2006. ^ "A Coat of Many Cultures". ucalgary.ca. ^ Islam and the halakhah | Judaism | Find Articles at BNET. Findarticles.com. Retrieved on 2010-10-19. In the early days of Islam, according to Islamic sources, a Jewish tribe of Arabia had broken the peace treaty with the early Muslims, resulting in a short conflict, which ended with the tribe's expulsion from Arabia. Since then, relations remained mostly peaceful under Islamic rule, with the exception of rare Jewish persecutions such as the 1033 Fez massacre, 1066 Granada massacre and 1834 looting of Safed. In the 20th century, the Zionist ideology was created, which wanted to re-establish a Jewish homeland in historic Israel, within the land of Canaan British mandate of Palestine. This created tensions between the Palestinian Jews and Palestinian Arabs, leading to, beginning in 1947, a civil war and the subsequent expulsion of many non-Jewish Palestinians. In 1948, the state of Israel was declared, and shortly after its declaration of independence, the Arab States declared war on Israel, in which the Israelis were victorious. After the 1948 Arab-Israeli War, twelve more wars were fought between the Arab States and Israel. These wars and conflicts were more political and nationalistic than religious but the Arab–Israeli conflict has weakened Islamic–Jewish relations severely. Saadia Gaon's commentary on the Bible bears the stamp of the Mutazilites; and its author, while not admitting any positive attributes of God, except these of essence, endeavors to interpret Biblical passages in such a way as to rid them of anthropomorphism. The Jewish commentator, Abraham ibn Ezra, explains the Biblical account of Creation and other Scriptural passages in a philosophical sense. Nahmanides (Rabbi Moshe ben Nahman), too, and other commentators, show the influence of the philosophical ideas current in their respective epochs. This salutary inspiration, which lasted for five consecutive centuries, yielded to that other influence alone that came from the neglected depths of Jewish and of Neoplatonic mysticism, and which took the name of Kabbalah. The Ishmaelites are not at all idolaters; [idolatry] has long been severed from their mouths and hearts; and they attribute to God a proper unity, a unity concerning which there is no doubt. And because they lie about us, and falsely attribute to us the statement that God has a son, is no reason for us to lie about them and say that they are idolaters ... And should anyone say that the house that they honor [the Kaaba] is a house of idolatry and an idol is hidden within it, which their ancestors used to worship, then what of it? The hearts of those who bow down toward it today are [directed] only toward Heaven ... [Regarding] the Ishmaelites today – idolatry has been severed from the mouths of all of them [including] women and children. Their error and foolishness is in other things which cannot be put into writing because of the renegades and wicked among Israel [i.e., apostates]. But as regards the unity of God they have no error at all. Arabic philosophy also found a following with the Jews, to whom belongs the honor of having transmitted it to the Christian world. A series of eminent men — such as the Tibbons, Narboni, and Gersonides — joined in translating the Arabic philosophical works into Hebrew and commenting upon them. The works of Ibn Roshd especially became the subject of their study, due in great measure to Maimonides, who, in a letter addressed to his pupil Joseph ben Judah, spoke in the highest terms of Ibn Roshd's commentary. Maimonides endeavored to harmonize the philosophy of Aristotle with Judaism; and to this end he composed the work, Dalalat al-Ḥairin (Guide for the Perplexed) — known better under its Hebrew title Moreh Nevuchim — which served for many centuries as the subject of discussion and comment by Jewish thinkers. In this work, Maimonides considers creation, the unity of God, the attributes of God, the soul, etc., and treats them in accordance with the theories of Aristotle to the extent in which these latter do not conflict with religion. For example, while accepting the teachings of Aristotle upon matter and form, he pronounces against the eternity of matter. Nor does he accept Aristotle's theory that God can have a knowledge of universals only, and not of particulars. If He had no knowledge of particulars, He would be subject to constant change. Maimonides argues: "God perceives future events before they happen, and this perception never fails Him. Therefore there are no new ideas to present themselves to Him. He knows that such and such an individual does not yet exist, but that he will be born at such a time, exist for such a period, and then return into non-existence. When then this individual comes into being, God does not learn any new fact; nothing has happened that He knew not of, for He knew this individual, such as he is now, before his birth" (Moreh, i.20). While seeking thus to avoid the troublesome consequences certain Aristotelian theories would entail upon religion, Maimonides could not altogether escape those involved in Aristotle's idea of the unity of souls; and herein he laid himself open to the attacks of the orthodox. The 12th century saw the apotheosis of pure philosophy. This supreme exaltation of philosophy was due, in great measure, to Ghazali (1058–1111) among the Arabs, and to Judah ha-Levi (1140) among the Jews. Like Ghazali, Judah ha-Levi took upon himself to free religion from the shackles of speculative philosophy, and to this end wrote the Kuzari, in which he sought to discredit all schools of philosophy alike. One of the most important early Jewish philosophers influenced by Islamic philosophy is Rav Saadia Gaon (892–942). His most important work is Emunoth ve-Deoth (Book of Beliefs and Opinions). In this work Saadia treats of the questions that interested the Mutakallimun so deeply — such as the creation of matter, the unity of God, the divine attributes, the soul, etc. — and he criticizes the philosophers severely. There was a great deal of intellectual cultural diffusion between Muslim and Jewish rationalist philosophers of the medieval era, especially in Muslim Spain. 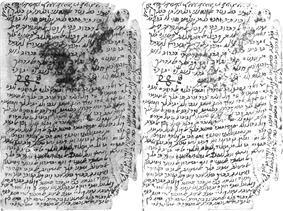 Manuscript page in Arabic written in Hebrew letters by Maimonides (12th century CE). There is a small bone in the body at the base of the spinal column called the Luz bone (known by differing traditions as either the coccyx or the seventh cervical vertebra) from which the body will be rebuilt at the time of resurrection, according to Muslims and Jews who share the belief that this bone does not decay. Muslim books refer to this bone as "^Ajbu al-Thanab" (عَجْبُ الذَّنَب). Rabbi Joshua Ben Hananiah replied to Hadrian, as to how man revived in the world to come, "From Luz, in the back-bone". Islam and Judaism both consider the Christian doctrine of the trinity and the belief of Jesus being God as explicitly against the tenets of monotheism. Idolatry and the worship of graven images is likewise forbidden in both religions. Both faiths believe in angels and demons; Jewish demonology mentions ha-Satan and Muslim demonology mentions Al-Shai'tan. Many angels also possess similar names and roles in both Judaism and Islam. Neither religion subscribes to the concept of original sin and both religions traditionally view homosexuality as sinful. Narrative similarities between Jewish texts and the Hadith have also been noted. For example, both state that Potiphar's wife was named Zuleika. Both Islam and traditional Judaism ban homosexuality and forbid human sexual relations outside of marriage and necessitate abstinence during the wife's menstruation. Both Islam and Judaism practice circumcision for males. The most obvious common practice is the statement of the absolute unity of God, which Muslims observe in their five times daily prayers (salat), and Jews state at least twice (Shema Yisrael), along with praying 3 times daily. The two faiths also share the central practices of fasting and almsgiving, as well as dietary laws and other aspects of ritual purity. Under the strict dietary laws, lawful food is called Kosher in Judaism and Halal in Islam. Both religions prohibit the consumption of pork. Halal restrictions are similar to a subset of the Kashrut dietary laws, so all kosher foods are considered halal, while not all halal foods are Kosher. Halal laws, for instance, do not prohibit the mixing of milk and meat or the consumption of shellfish, each of which are prohibited by the kosher laws, with the exception that in the Shia Islam belief shellfish, mussel, things like that and other fish without scales are not considered halal. Muslims commonly refer to Jews (and Christians) as fellow "People of the Book": people who follow the same general teachings in relation to the worship of the one God worshipped by Abraham - Allah. The Qur'an distinguishes between "People of the Book" (Jews and Christians), who should be tolerated even if they hold to their faiths, and idolaters (polytheists) who are not given that same degree of tolerance (See Al-Baqara, 256). Some restrictions for Muslims are relaxed, such as Muslim males being allowed to marry a woman from the "People of the Book" (Qur'an, 5:5), or Muslims being allowed to eat Kosher meat. Islam and Judaism share the idea of a revealed Scripture. Even though they differ over the precise text and its interpretations, the Hebrew Torah and the Muslim Qur'an share a lot of narrative as well as injunctions. From this, they share many other fundamental religious concepts such as the belief in a day of Divine Judgment. 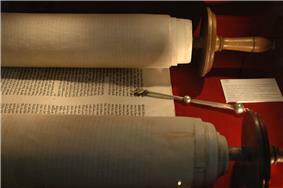 Reflecting the vintage of the religions, the Torah is traditionally in the form of a scroll and the Qur'an in the form of a codex. The Qur'an speaks extensively about the Children of Israel (Banû Isrâ'îl) and recognizes that the Jews (al-Yahûd) are, according to lineage, descendants of Prophet Abraham through his son Isaac and grandson Jacob. They were chosen by Allah for a mission: "And We chose them, purposely, above (all) creatures." [Sûrah al-Dukhân: 32] Allah raised among them many Prophets and bestowed upon them what He had not bestowed upon many others: "And (remember) when Musa said unto his people: O my people ! Remember Allah's favor unto you, how He placed among you Prophets, and He made you Kings, and gave you that (which) He gave not to any (other) of (His) creatures." [Sûrah al-Mâ'idah: 20] He, also, exalted them over other nations of the earth and granted them many favors: "O Children of Israel! Remember My favor wherewith I favored you and how I preferred you to (all) creatures." [Sûrah al-Baqarah: 47] They were chosen by God for a mission (44:32) and God raised among them many Prophets and bestowed upon them what He had not bestowed upon many others (5:20). There are many common aspects between Islam and Judaism. As Islam developed it gradually became the major religion closest to Judaism, both of them being strictly Monotheist religious traditions originating in a Semitic Middle Eastern culture. As opposed to Christianity, which originated from interaction between ancient Greek and Hebrew cultures, Islam is similar to Judaism in its fundamental religious outlook, structure, jurisprudence and practice. There are many traditions within Islam originating from traditions within the Hebrew Bible or from postbiblical Jewish traditions. These practices are known collectively as the Isra'iliyat. In Los Angeles there has been a formation of an interfaith think tank through the partnership of neighboring institutions the University of Southern California, The Hebrew Union College, and Omar Foundation. The Center for Muslim-Jewish Engagement has an extensive online resource center with scholarly works on similar topics from Muslim and Jewish perspectives. The Center of Muslim-Jewish Engagement has begun to launch an interfaith religious text-study group to build bonds and form a positive community promoting interfaith relations. Good Jewish-Muslim relations continue in Detroit, which has the nation's largest Arab-American community. Jewish organizations there have established good relations with a religious group called the Islamic Supreme Council of North America. In Cleveland, Jewish community leaders put Muslim-Jewish relations on hold after the spiritual leader of a prominent mosque appeared in (a 1991) videotape ...aired after 9/11 by a local TV station. Imam Fawaz Damra calls for "directing all the rifles at the first and last enemy of the Islamic nation and that is the sons of monkeys and pigs, the Jews." The revelation was all the more shocking since Imam Damra had been an active participant in local interfaith activities. Post 9/11 remarks made by Muslim leaders in Cleveland and Los Angeles also led to the suspension of longstanding Muslim-Jewish dialogues. Some Jewish community leaders cite the statements as the latest evidence that Muslim-Jewish dialogue is futile in today's charged atmosphere. John Rosove, senior rabbi of Temple Israel of Hollywood, and other Jewish participants withdrew from the three-year-old Muslim-Jewish dialogue group after one of the Muslim participants, Salam al-Marayati of MPAC, suggested in a radio interview that Israel should be put on the list of suspects behind the 11 September attacks. 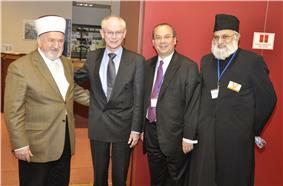 However, in January 2011, MPAC member Wa’el Azmeh and Temple Israel engaged in an interfaith dialogue. The interview was published 4 October on a Web site affiliated with Cairo's Al-Azhar University, Islam's most respected theological academy. Immediately after 9/11, Imam Al-Gamei'a had presided over an interfaith service at his mosque. At the service the imam was quoted as saying, "We emphasize the condemnation of all persons, whoever they be, who have carried out this inhuman act." The Reverend James Parks Morton, president of the Interfaith Center of New York, who attended the service, called Imam Al-Gamei'a's subsequent comments "astonishing." "It makes interfaith dialogue all the more important," Reverend Morton said.